Moving Pads:Moving Pads can also be referred to as moving blankets, furniture moving blankets, packing blankets, shipping blankets or furniture moving pads. We often mention weight per dozen when describing our moving pads/blankets. 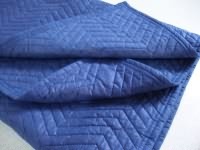 Because quality of moving pads/blankets are rated by the amount of fill, showing weights of blankets can help to easily compare quality between different styles. All of our moving pads are in stock and ready to ship.